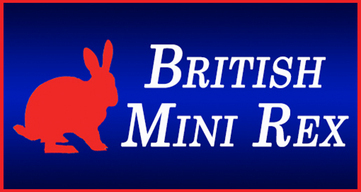 The British Rabbit Council sets the standard to which the Mini Rex is bred and judged at a show. 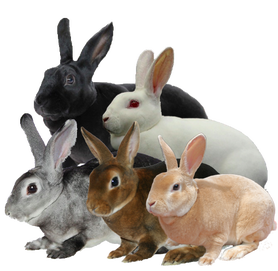 The Breed Standards Book contains detailed descriptions of all the breeds which are recognised in the United Kingdom by the British Rabbit Council and is readily available from the BRC. 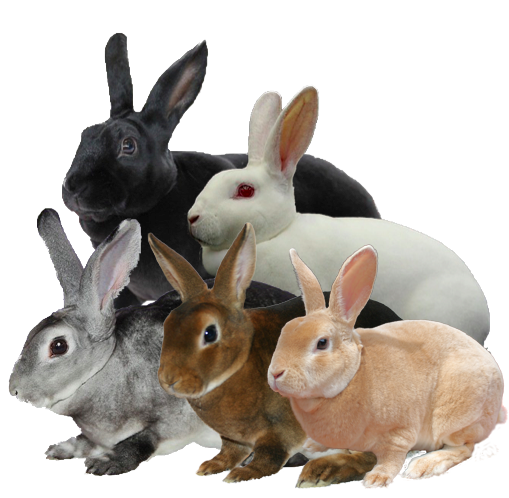 Every serious Mini Rex breeder has studied and pays great attention to the Breed Standard. The Broken Mini Rex has an additional Breed Standard which contains details concerning the Pattern of the Broken Mini as seen below. FUR: 40 points. To be approximately 1.27cm (1/2inch) in length. Fine silky texture free from harshness and wooliness, intensely dense, smooth and level over the whole body, of a lustrous sheen, firm and plush like character, devoid of projecting guard hairs. TYPE: 20 points. Well proportioned and graceful carriage, the body sloping gently up to well rounded quarters set on strong hind legs, medium bone. Head bold and broad, ears erect and to be in proportion to body, dewlap should not be excessive, eyes and toenails should preferably match the body colour. 1. Fur - As per Mini Rex Standard. 2. Type - As per Mini Rex Standard. 3. Colour and markings - All colours as per Mini Rex Standard. 4. Broken Blanket Pattern - To have both ears completely coloured; white at base is permissible. Colour to head to match the body colour, which can be solid or with eye circles with evenly balanced nose spots. The body markings to be Blanket Pattern with colour starting at the shoulders and continuing over the back, sides and hind quarters. Preference should always be given to an evenly balanced pattern. Colour spots are permissible to the legs, belly and to the genital area. Total colouration should not be more than 60% of the body area, this cannot be less than 40% white. Disqualifications - As per Mini Rex Standard and an absence of colour to either ear, i.e. white patches.